When positioning elements, you can retain the visual scale of elements as you move them in the Z-axis in the Side or Top views. As you move drawing layers on the Z-axis, they are scaled to preserve their size in the camera. From the Tool toolbar, select the Maintain Size tool. 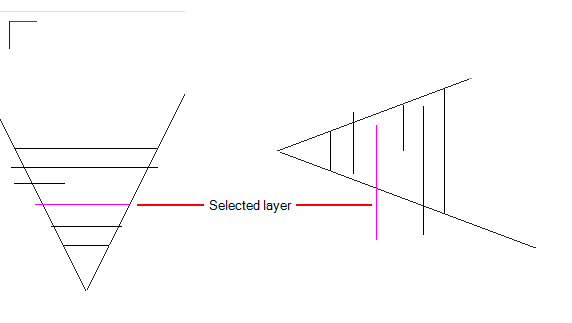 In the Side or Top view, select a layer. The selected layer is highlighted in pink. Drag the layer to the correct depth position in the camera cone. Your element aspect remains the same in the Camera view. To scale the element up or down in relation to its distance to the camera, select the Layer Transform tool from the Tools toolbar. In the Tool Properties view, make sure the Peg Selection Mode option is deselected. In the Top view, drag the element sideways to position it horizontally. Hold Shift while dragging to make sure it only moves along the X-axis. In the Side view, drag the selected element up or down to position it vertically. Hold Shift while dragging to make sure it only moves along the Y-axis.